The Talmud states that the instruction not to eat “flesh with the life” was given to Noah, and that Adam and Eve had already received six other commandments. Jewish scholar Maimonides (13th century) taught that gentiles may have a part in the world to come (Olam Haba) just by observing Noahide law. But Jews are obligated to observe the whole Torah which is comprised of 613 commandments. The Book of Ruth begins with the story of Elimelech who married Naomi. 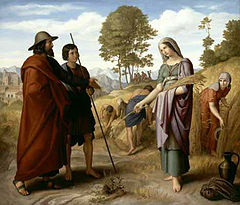 They and their two sons, Mahlon and Chilion, moved from Bethlehem to Moab, because their was a famine in their homeland. The sons married Moabite women. One son married Orpah, and the other married Ruth. Elimelech and his two sons died later. Naomi then decided to move back to Bethlehem. She told each of her daughters-in-law to return to her own mother’s home. Orpah did so. Naomi had a kinsman of her husband’s in Bethlehem, a mighty man of wealth, of the family of Elimelech; and his name was Boaz. Ruth went to glean ears of corn in Boaz’ field. Gleaning was the act of collecting leftover crops from farmers’ fields after the harvest. In some cases, farmers would leave the corners of their fields unharvested for the benefit of the gleaners who were poor. Boaz was kind to Ruth. Ruth then returned to Naomi and gave her the barley that she had gleaned. Naomi reminded Ruth that Boaz was their family goel. The goel – sometimes translated kinsman-redeemer – had a specifically defined role in Israel’s family life. · The kinsman-redeemer was responsible to buy a fellow Israelite out of slavery (Leviticus 25:48). · He was responsible to be the “avenger of blood” to make sure the murderer of a family member answered to the crime (Numbers 35:19). · He was responsible to buy back family land that had been forfeited (Leviticus 25:25). · He was responsible to carry on the family name by marrying a childless widow (Deuteronomy 25:5-10). Naomi instructed Ruth as to how to petition Boaz to exercise his responsibilities as her goel. But Boaz had a kinsman who a closer relative, or goel, to Ruth than himself. Boaz asked this kinsman to purchase or redeem a pracel of land which had belonged to Elimelech and that Naomi was selling. This deal also required that the kinsman take Ruth as his wife to raise up children in behalf of Elimelech. Boaz recognized that this kinsman had the first right to redeem the land and marry Ruth. But the kinsman declined. So Boaz himself redeemed the land and married Ruth. Ruth and Boaz had a son Obed, who became the father of Jesse, the father of David. Boaz thus revived the name and seed of Elimelech who was dead. Boaz foreshadowed Jesus Christ who has redeemed us from death with his blood atonement. As Boaz married Ruth, Christ takes the church as his bride.